Address: Nayatel (Private) Limited 73-E, GD Arcade, Fazal-e-Haq Road, Blue Area, Islamabad. 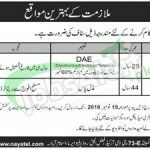 Here in the following, you will be having the job from Nayatel Jobs 2018 Islamabad & Rawalpindi Online Apply Latest Advertisement. One of the well known and famous companies which are named as Nayatel is seeking to hire the well disciplined, caliber and adroit applicants are required to fill out the following posts which are named as (Associate Engineer, Security Guard). The vacant posts need to be filled by the candidates who possess DAE (Electronics/Electrical/Telecom)/Matric and experience is eligible to apply and for the post of a security guard, retired army officers/soldiers are eligible to apply. Attractive salary package will be paid to the applicants with a brilliant and cooperative atmosphere. All those applicants who belong to Islamabad & Rawalpindi are welcome to apply as soon as possible and get rid of unemployment. Now, I will let you know about its further details which are remaining to be disclosed. Interested applicants need to apply if they fulfill the said criteria have to send CV to the following address given below. The applicants are required to mention the name of the applied post on the CV. The last date for applying is November 19, 2018. Late received and those of incomplete CV will not be entertained. Last Date To Apply: November 19, 2018. Address: HR Department, Nayatel (Private) Limited 73-E, GD Arcade, Fazal-e-Haq Road, Blue Area, Islamabad.